X Banner Stand is lightweight, easy to carry, set up, and store, it makes the perfect banner system at an affordable cost. This stand is perfect for indoor/outdoor events, retail environments, banks, trade shows, exhibits & conference rooms. The adjustable lower hook allows you to change the banner tension strength to be able to display multiple different banner sizes using the combination of upper poles. 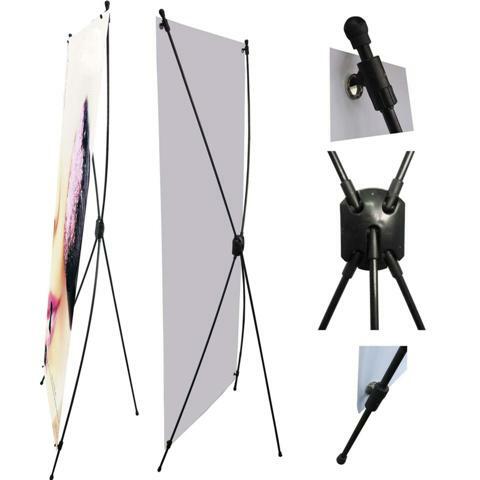 Priced from $175.00 includes curl free block out banner display. Our state-of-the-art sign printing equipment and economical pricing attracts clients throughout Eastern Ontario including the greater Ottawa area. We are a family run business that can deliver the personal service to match all your needed signs. A large number of our sign clients are from the Ottawa region including Gatineau, Cumberland, Gloucester, Kanata, Nepean, Vanier, Goulbourn, Osgoode, Rideau, West Carleton, Orleans, Barrhaven, Stittsville, Bells Corners, Westboro, Blackburn Hamlet, Hunt Club, Morgan's Grant, Riverside South, Manotick, and Riverview. We also serve the closer neighborhoods of Bel-Air Heights, Bel-Air Park, Braemar Park, Britannia, Britannia Bay, Britannia Heights, Carlington, Carleton Heights, Central Park, Civic Hospital, Copeland Park, Courtland Park, Findlay Creek, Glabar Park Hampton Park, Highland Park, Hintonburg, Kenson Park, Island Park, McKellar Heights, McKellar Park, Mechanicsville, Lincoln Heights, Ottawa West, Queensway Terrace, North Queensway, Michelle Heights, Qualicum, Rideau View, Tunney's Pasture, Westboro, Redwood, Woodpark, Woodroffe North, and Whitehaven. Call us for a free sign consultation for any signage needs you have. With over 35 years making signs, you can find our signs in literally every business area of Ottawa. You can trust Agent Signs to deliver your best sign solution. Copyright © 1979-present by Agent Signs & Designs. "A Sign of True Quality" is a trademark of Agent Signs & Designs Ltd.